Imogen's Typewriter. 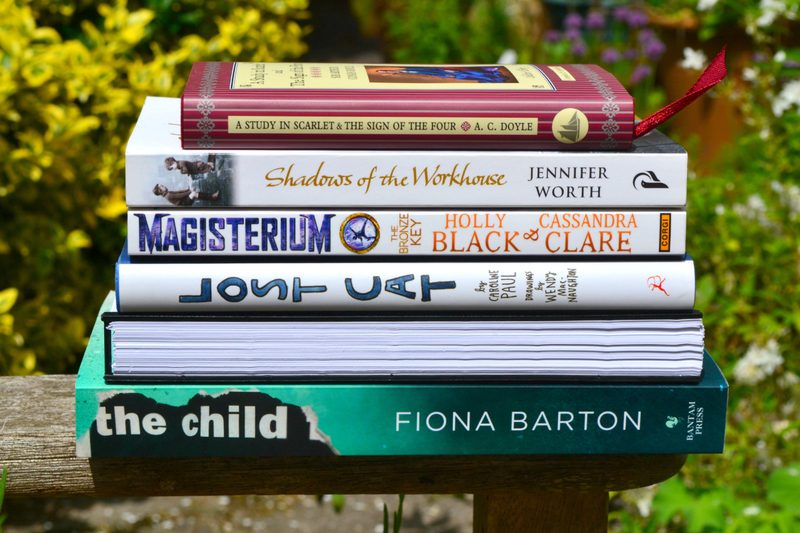 : Books I Read in May! I had a pretty good reading month in May! I was completely expecting to come back with another two or three book month because I had deadlines and health stress, but I think after having such a disastrous April, I needed to read some good books! Three of the eight were audiobooks which might've helped too because I can listen to them when I'm really poorly. Who got taken in by the new Audible audiobook editions of the Sherlock Holmes books read by Stephen Fry? I did! I snapped those babies up as soon as my monthly credit came through and immediately dived in. The thing is- I'm not sure I like the books as much as I like the idea of the the characters? A Study in Scarlet was definitely the most interesting account of how Sherlock solved the case of the two novels and the bunch of short stories I've listened to so far. I'm always interested in the observations and deductions. There was such a tangent to tell the backstory though. It was just a weird anti-Mormon tirade that kept going, and it didn't even add anything. Motive is important. But I didn't understand why I needed the history of the Mormon religion with it. Oh boy, the racism. I get it, it's the time period that it was written in but it was really uncomfortable. And the quote from Sherlock; "Women are never to be entirely trusted", at least Watson brushes this off but it really held no purpose to the story apart from alienating me as a reader. As far the story though, it was pretty interesting. The motive tangent in this one wasn't as long or as monotonous as A Study in Scarlet at least. "-I never guess. It is a shocking habit- destructive to the logical faculty." I've been reading this for months. I checked my Goodreads and I started it in February. That's a long time to be reading the same book, but it's also a long time for me to not completely give up and relegate it to my 'paused' shelf. I really enjoyed the first book. But it had a lot to do with the format; short chapters encompassing a whole experience, while the book itself slowly moves forward along in time. This second book was written in such a different way that I looked in the acknowledgements, and even Googled, to find out if there was a ghostwriter. If there is, it hasn't been talked about but this is written like a fiction book rather than a collection of memories. It just didn't work for me in the same way. There was so much obviously fabricated because I really doubt that some of the people written about talked about their stories, and definitely not in the amount of detail this book wants you to believe. It's a shame because I want to know about Jennifer Worths life and how that was affected by the people she treated, not fictionalised histories where she plays a minor background role. However, I've flipped through the next book and it does seem to go back to the format of the first book so I'm not put off yet! "-The more I read, the more ignorant I realised I was. I devoured history like other chaps devoured booze." This is the only book I ended up reading from my A to Z Readathon TBR and it really deserves a full review like book one and book two because I loved it and have so many thoughts and feelings! I wrote a full review here! Lost Cat was so cute and I have a review coming with pictures posed with my cats. Because of course. I read and reviewed The Widow by Fiona Barton last year. This is being published at the end of June and I'll be writing a full review to follow that trend! I listened to the audiobook of The Martian at the beginning of May and I liked it. The protagonist Mark Watney was funny and totally the type of guy whose diary log I can listen to for eight hours. I much preferred his first person segments to the prose style when Weir wrote of the characters back home, but maybe that's the podcast-fan in me. I listen to a podcast similar to this and it's just kept going, no ending in sight. Whereas all I get are feelings of disappointment that the ending was so abrupt from The Martian, it could've given us way more. Watney is also living my best life with all those potatoes, I don't know what he's complaining about! The thing is, I listened to this at the beginning of May and now that it's a month later- I know I'm never going to listen to it again which is rarely my experience with audiobooks! "How come Aquaman can control whales? They're mammals! Makes no sense."